As a new product development design engineer and project leader for over 25 years, I’ve interviewed and hired many outsourced professional services, including marketing consultants, graphics designers, software developers and several industrial designers. Trig Innovation is the best professional service I’ve ever worked with – in fact, it’s no contest. In terms of industrial designers in particular, Trig delivers exceptionally good value, being able to walk the fine line between creativity, schedule and budget. Ty Hagler possesses the rare combination of creative design expertise while maintaining awareness of project scope, budget and design constraints. He also has an amazing ability to “check his ego” and let his clients interactively discuss and critique his design proposals, even at the later stages of the industrial design process. Throughout the project Trig used online collaboration software to keep our internal design team in sync with Trig’s design team. In fact, Trig took the lead in pacing the ID project. From concept to refinement to rendering, Trig’s presentations were organized and “on point” allowing the diverse audience of mechanical, electrical and production engineers, sales and marketing, and senior management to understand the tradeoffs and converge on viable solutions. At these presentations, Trig served as a “coach” guiding the audience through the selection process, and allowing us to select the optimum ID solution. After Trig made their recommendations, they knew when to tactfully step aside and let my design team lead the discussion, striking a perfect balance between leadership and collaboration. Aside from their ID skills, the best thing about working with Trig was the “whatever it takes” attitude, including the ability to always take suggestions from my design team. 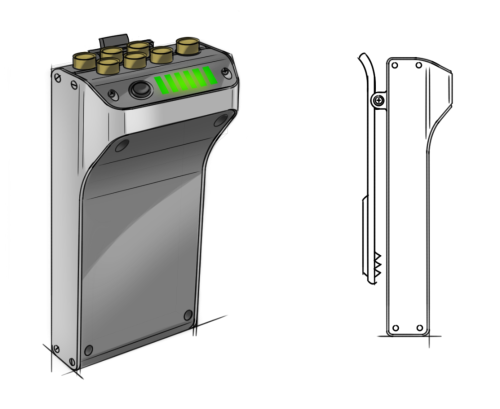 This even included suggestions which were contrary to Trig’s initial design, but were appropriate for the design goals of my company.